No, really, I loved it. After reading so many books lately that have the same general feel, this book was refreshingly different. The main character was probably one of the most unique characters I've ever read. She made me laugh and did so many things that were so true to her character even if I wanted to shake my head in disbelief. This girl could've walked right off the page and I wouldn't have been surprised (well, maybe I would've been a little startled, but then I would've thought, 'that's so her to walk off the page like that.') It's very clean for those of you worried about your daughter's sensitive little eyes and minds. And it's rich with relationships, emotion, and intrigue. LOVED it. "When KJ Carson is assigned to write a column for her school newspaper about the wolves in nearby Yellowstone National Park, she’s more interested in impressing Virgil Whitman, the new kid in school and the photographer assigned as her partner, than in investigative journalism. 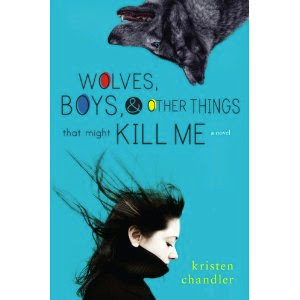 But before long, KJ has a face-to-face encounter with a wolf that changes her and the way she thinks about wolves. With her new found passion for protecting these controversial animals, KJ inadvertently ignites the fuse of the anti-wolf sentiment in the community. First Virgil is injured during a town parade, and then her father’s store is set on fire in retribution. To stop the escalating violence, KJ follows Virgil to the cattle ranch of the most outspoken anti-wolf activists in town, against her father’s will. What she discovers there threatens everything and everyone she cares about. Happy Thanksgiving everyone. I hope you enjoy the holiday. Sounds like a refreshing change. Happy Thanksgiving. I love the title! It looks like a great one! Sounds like a great book. I'll definitely look for it! You write such wonderful reviews. It makes me sad that you won't be able to review mine. LInda, HA! I've always thought my reviews were a little ridiculous. But, if they make you want to read the book then I guess they're doing their job. And I will definitely be reviewing your book. I wish I could review it now it's so brilliant. If you have cleaned 1300 minutes so far this month, I think your house must be very clean. I am going to go clean my kitchen floor now as not to be outdone. Jessie, Actually, now that I've been timing myself this month, I've discovered that it takes me about 1 hour a day to do the basics: dishes (2 x a day), laundry (wash, fold, put away), and wipe off counters and sweep floor. So since it's the 24th and I'm only at 1500 minutes, I have done exactly 60 minutes of extra work. Divide that by 24 days and that breaks down to an extra 2.4 minutes of work a day (aside from the basics). In other words, my house isn't clean at all. The dishes are done, the laundry is folded and put away, my floor is swept. :) Now, was I on track to actually finish that 2700 minutes by the end of the month, my house would probably be sparkling. Alas, it is shameful. It's always fun to read something different. I'll have to put this on my list. I've been on the same plan as you for the cleaning. I failed. Ugh. I was doing so good at the beginning and then I got rebellious. Then I started saving up things I would normally have done thinking, "I'll do all those things together when I'm on the clock." NOT helpful thinking. I did get somethings I'd been putting off done, but I still have tons to do to get things the way I want them. I haven't heard of this--I'll definitely look into it. I loved!!! this book. The main character was so imperfect. She was different than the typical main character and I loved all of her flaws. I laughed out loud many times...Loved it!